Most people claim to be befuddled by English grammar. I’m not surprised; it can get pretty complicated. But I think a bigger problem is the way grammar is taught–if it’s taught at all.We make it too difficult too fast. The basic concepts of grammar are not hard to understand, really. I’ve talked about it before. The first key is to separate grammar from usage. Forget about subject-verb agreement, proper pronoun case, comma rules and the difference between further and farther. All that comes later. Grammar study should begin with analysis — taking apart language to see how it works, learning the basic parts and their names and functions. I like to think of grammar in terms of four inter-related parts I call the grammar zones. They represent the big picture of grammar. When talking grammar, it always helps to know which zone or zones you are in. The first and most fundamental of the zones is the parts of speech. Some scholars take different approaches to parts of speech, but I prefer the method that includes eight parts. Think of it this way: every one of the hundreds of thousands of words you will use in your lifetime fits into one of just eight categories. There are only eight jobs that a word can do. That’s it. 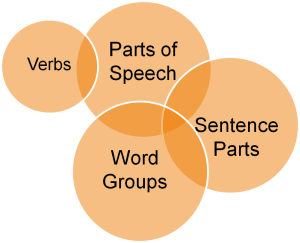 The first thing to grasp in the study of grammar is the eight parts of speech. Once we understand the functions, we can identify what every word is doing in any sentence. A noun is a word that names a person, place, thing, or idea. Most of us quickly comprehend persons, places, and things, but some get confused by the idea nouns. So, we’ll skip those for now and stick to concrete nouns — the ones that name people (Isaac, lifeguard, cowboy), places (Cuba, downtown, bedroom), and things (postcard, ice cube, oxygen). Pronouns are substitute words. They are used in place of nouns (and sometimes other pronouns). There are a fixed number of pronouns in English. That means if you worked at it, you could memorize all of them, though I don’t recommend that. There are various categories of pronouns, but going into all of them too early gets confusing, so we’ll stick to the most basic kind of pronoun until we get the hang of it. We call them personal pronouns, and they include I, me, you, he, him, she, her, it, we, us, they, and them. Do you understand how pronouns work? They take the place of nouns. Instead of saying Brian is writing this lesson for you, I would say, I am writing this lesson for you. The pronoun I takes the place of my actual name, and the you takes the place of your name, which is handy because I may not know your name. Verbs are the heartbeat of language. They show action or state of being. But forget the “state of being” ones for now. Just like idea nouns, they confuse people who are just learning. Just remember that verbs show action: run, jump, slap, sleep, rest, think, imagine, enjoy. Notice that the action may be mental or emotional action, not just physical. Verbs can be changed to indicate time. We won’t go into much detail about that here because that concept belongs in the Verb Tense Zone, but just realize that verbs come in different forms. Run, ran, and running are all forms of the verb run, just like jump, jumped, and jumping, or has, have, had and having. Don’t worry about the differences now, just be able to recognize words that show action. Another way of thinking about it is that verbs show what people and things do in a sentence. The rabbit chewed through my new tires. The astronaut has ordered another cup of coffee. Easy, right? Nouns name stuff. Pronouns are those little words we use in place of nouns. Verbs show action. 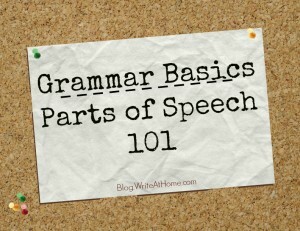 Get these simple ideas and you have taken the first step in understanding English grammar. To see how well you know these, click the links below to take a quick online quiz. These are easy quizzes. I bet you get them all right. Leave your comments below. Feel free to share your scores as well! The quiz link isn’t working. Tried repeatedly. Page not found. Check link and try again. Sorry about that, Cynthia. I have fixed the problem.